Since 2002. Reviews of Theater, Music and Arts events in the Twin Cities and around the world. Looking for a little alternative holiday entertainment? Something that doesn’t require dressing up or pondering the financial commitment for the tickets? Well, here it is: Dangerboat Productions “The Unscripted Minnesota Holiday” at the Bryant-Lake Bowl Theater – and it’s family-friendly without the elves or unbearable sweetness. The audience is charged with providing the name of a fictional Minnesota town, the town’s annual holiday celebration, the industry of the town’s wealthiest citizen (and villain), and the cast member who will be that night’s hero – chosen by the spin of the wheel on director and host Tane Danger’s iPad. Oh, how will the hero rescue the celebration and save the town? (Fear not, that’s where its similarities to the Grinch end.) At the top of the show, the performers have no more idea than you do, and therein lies the entertainment. The show we saw last night didn’t, actually, have much to do with the holidays (not that anybody cared), but it was most certainly unscripted and set in Minnesota in a made-up town provided by the audience. In our case it was “Hockeyville,” but who knows where you’ll end up? So, yes, there is a structure. Sort of. What held this show together, as much as anything, was Dennis Curley’s improvised piano accompaniment – a brisk show opener, a “bad guy” riff, a few lush chords to underscore (or prompt?) a love encounter, a grander vibe to signal the finale. But you will see an entirely different show, perhaps with a partially different lineup, too. And that’s the point. You don’t go to see improv because it’s safe; you go because it’s not, which is the fun of it. 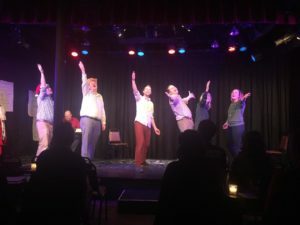 The cast lineup are all experienced with improvised performance and jumped in with jokes to pivot the story in ever-changing directions. There was some floundering in the middle-ish, but part of the intrigue was watching them figure their way out of it. Last night’s cast included Lorna Landvik, Jim Robinson, Logan Martin, Max Beyer, tBrandon Boat, and Hannah Wydeven. Their biggest challenge was doing a musical with but one singer. The rest might not recognize a melody if it wrapped around them and lit up. But they sang anyway, in a manner of speaking, with great gusto. This is the kind of show made infinitely more enjoyable by a full-house audience willing to buy into the silliness, so grab a few friends and go have a good time. Only three shows left: tonight, Monday, Dec. 4 and next Friday, Dec. 8.